Wind Farm Realities has a post on the newish study; Hoen, again. 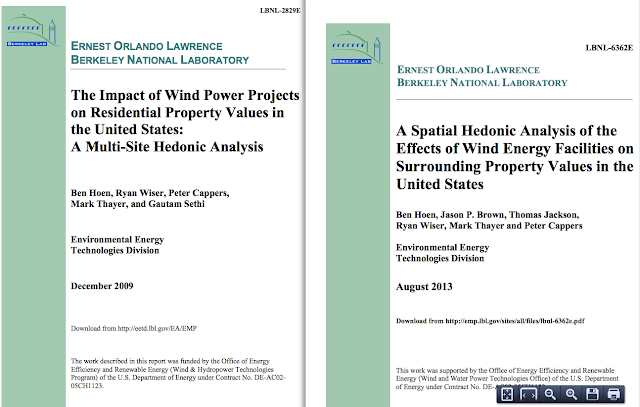 Hoen admits these price differences exist at the top of page 24, but goes on to say: “Both conclusions of adverse turbine effects, however, disregard other important differences between the homes, which vary over the periods and distances.” And what would those important differences be? His raw data includes just house square feet, acres and age. The close-in houses have, on average, about 100 more square feet than the far-aways (roughly 1550 vs 1650). They average 2 acres vs. somewhat less than 1. They are older, averaging about 60 years vs 50. Would you be willing to trade off an extra 10 years of age for a much larger lot and some extra space? I think most people would, so there’s nothing in the raw data to explain the difference – except, of course, the elephant in the room, the turbines. You could try to argue that maybe there’s some other problem with the close-ins. Did I mention these data came from 9 states, 27 counties and 67 projects? It is quite a stretch to propose something else, as even a landfill at every one of the close-in neighborhoods wouldn’t be enough (Hoen, page 4). It seems that wind turbines are in a class of their own when it comes to decreasing house prices. Hoen, again can be read fully at Wind Farm Realities, where Mike McCann has already commented.